With thirteen thousand islands, Indonesia is tagged as the largest archipelago in the world. Because of this, Indonesia is very famous for its epic beaches and other tourist attractions that are visited by millions of tourists each year. One famous island you can’t ignore is the Island of Bali. With its beautiful landscape, world-class beaches, and friendly people it’s no wonder that Bali is often called the Land of the Gods. If you are planning your trip to Bali soon, here are the 5 tourist attractions you may want to visit and ideal places for you to experience the wonders of Bali! It is a lovely beach mainly composed of small coral with gold sand. Sanur Beach is situated at Sanur, Bali. Since the waves here are mild, it is perfect for swimming activities. With crystal clear waters, this place is simply heaven on earth. Nonetheless, if you spot small starfish while roaming around the beach, please be kind and take them back to the water. Bias Tugal is also known as Pantai Kecil or Little Beach. This deserted beach is tucked away in Padang Bai. Somehow, it is hidden and can only be accessed via a rocky path. After the 500m trek, a blue sparkling sea and white sand beach will welcome you. Enjoy this hidden getaway with your friends and loves ones. For nature lovers, Ubud Monkey Forest is the best place to be! Situated in Ubud, Bali Indonesia, this forest sanctuary offers nothing but the best, making it a very popular tourist attraction in Indonesia gaining over 10,000 tourists every month. Natives view this forest as something spiritual, and educational. With its luxurious accommodation and fashionable restaurants, Seminyak is famous for its sophisticated atmosphere that’s at the same time relaxing and comfortable. Located in South Bali, you can get to the place by taking the Jalan Sunset bypass. Feel free to explore by bicycle or motorcycle. 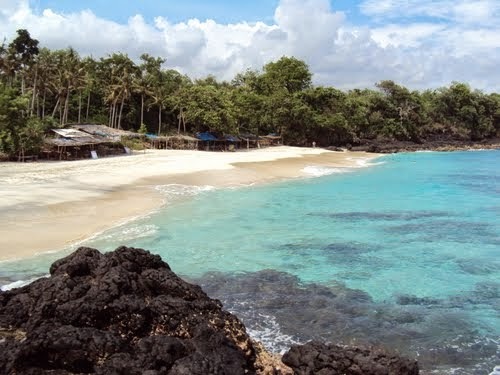 Tanah Lot offers the best escapade for beach goers. Beat the heat and enjoy the fantastic beach with a picturesque landscape to ponder. Tanah Lot also has a temple that sits on the majestic offshore rock. The huge rock has been continuously shaped by the ocean tide for many years. It is commercialized to boost the tourism of Bali. You will have to pay the required amount before you can enter the exact location of Tanah Lot. Visitors can also purchase memorabilia from their souvenir shops. After the whole day of escape to the majestic tourist attractions of Bali, Indonesia, you deserve to be treated with luxury and style. Not to mention the genuine hospitality of the Balinese people. Located in Tanjung, Benoa and over 7kms away from the Ngurah Rai International Airport, Conrad Bali can make your holiday in Bali a wonderful experience. Conrad Bali is the perfect place to stay in Bali,Indonesia with their state-of-the-art facilities and spacious guest rooms. You can relax in comfort and look forward to another day of fun and adventure. With the facilities and amenities being offered at Conrad Bali you will experience the ultimate holiday experience in Bali. It it is gastronomic delights you are after, you will not be disappointed by the numerous dining options to suit your needs. Their in-room dining is even available for 24 hours. There’s nothing more you could wish for; everything can be found in Conrad Bali. Traveloka offers the best and most competitive prices with no hidden charges. In addition, Traveloka also does flight reservations as well as hotel reservations for most of the hotels in South East Asia.